Cyperus retrorsus.Richard Old.xidservices.com.New England Wild Flower Society.gobotany.newenglandwild.org (Accessed 4/2014). 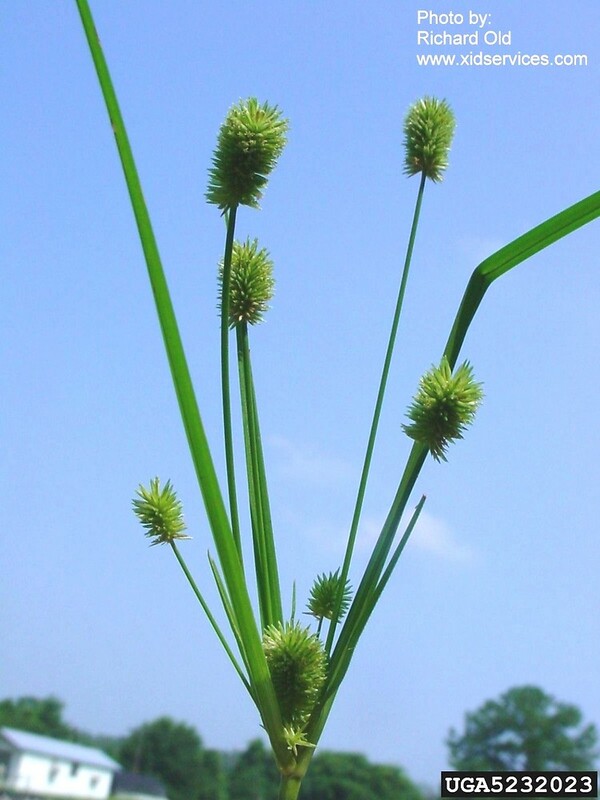 Cyperus retrorsus is a perennial C4 sedge (Li et al. 1999), to 1 m tall from a short, tuberous rhizome, stems smooth, very slender. Leaves shorter than flowering stems, to 0.5 cm wide. Flower spikelets numerous, crowded, radiating horizontally, to 0.6 cm long, with 1-3 flowers, scales thin, egg-shaped 0.2 cm; inflorescence bracts 4-8, mostly longer than inflorescence, spike stalks (rays) 5-9, to 10 cm long, spikes dense, short-cylindrical, to 2.5 x 1.2 cm. Fruit an achene, 3-sided, oblong to 0.15 cm; blooms and fruits July-Oct.
Habitat: Sandy barrens, coastal sands.